This is the last post of the cooking party before I announce the winner of the Cookbook Giveaway tomorrow. 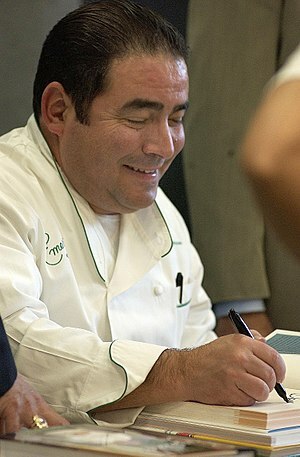 I know that we’ve been sort of Emeril-centric around here the past few weeks but we also had some awesome giveaways! After tomorrow’s announcement (and one more recipe peek to round it out) we’ll be back to diving into an exotic variety of food, most of which you can cook in 30 to 45 minutes or less. In fact, I’ve been saving up pics of some fabulous dinners we’ve had in between and before Emeril mania started around here, so keep an eye out for tons of great new recipes! This is Emeril folks and this dish is, traditionally, a dish with a wee bit of heat. While I like and can take a little heat, mostly in the name of flavor, because of heartburn issues — I took this down a notch (sorry, Em!) The way to reduce the heat in this dish, while still retaining the flavor is this: I changed the chorizo for kielbasa sausage, removed the seeds and ribs from the jalapenos and skipped the Louisiana hot sauce. This made the dish mild enough to bypass the heartburn but flavorful enough to enjoy. I don’t know if comes from the summer trips, staying with my grandparents as a child, where they would take me fishing for catfish and trout — but I love fish. Up at dawn, loading up the truck, securing the aluminum row boat and packing cheese sandwiches. We would sit on the bank of the lake all day, in the summer sun wearing one of grandma’s extra straw hats as she readied us both to cast off. The skin on my bare olive complexioned back growing tawnier with every hour but never burning, leaving tan lines in the shape of the thin spaghetti straps of my swimsuit. These straps, the only thing that once shielded me from a miscast line that should have hooked my shoulder but instead snagged my swimsuit. Grandma always found a way to sneak a giant Cadbury Fruit and Nut bar into our lunchbox without me seeing it. At some point in the day, as we grew weary and the fish in our catch bucket settled down, she would pull out this treasured treat. Slowly unwrapping the silver foil from around the chocolate and breaking off just a couple of chunks for us to share. Those days were long and lazy, except once we got the catch home and had to clean and scale it, prepping some for dinner and packing the rest for the freezer. Sitting at our TV trays in my grandparents little trailer, munching on fresh-caught, crispy on the outside juicy on the inside, fried catfish and finishing our dinner with a slice of cool, salted watermelon — well, that was the taste of summer to me. Happy 92nd Birthday this week Granny "Nick"! I love you! Maybe that’s why I have a tendency to equate seafood with summer. Summer time brings lobster roll sandwiches, shrimp tacos and scampi, crab cakes on a bed of spinach, salmon baked on a wood plank with caramelized onions, orange and sweet basil, seared halibut topped with zucchini, tomatoes and mushrooms, and mussles cooked in butter and wine with spinach and bacon. I love seafood — everything from tender meaty fish like salmon and halibut to rich crustaceans like shrimp, lobster and crabs, to the tender tug of shellfish mussels, clams and oysters and the delicate chew of perfectly cooked squid and octopus. As a general rule, if it’s from the sea — it’s for me! But one thing I’ve never cooked before is shrimp stew. Now, thanks to Emeril and his Sizzling Skillets and Other One-Pot Wonders we all can make this richly satisfying and belly warming stew this fall — because he not only gave us the recipe to preview here but also included his recipe for shrimp stock. This comforting, simple stew is a Cajun dish that many home cooks in Louisiana enjoy, especially during the Lenten season. It is easy to make and feeds a bunch. The trick is getting the roux to the right color . . . about a notch darker than peanut butter should do the trick. A homemade shrimp stock makes all the difference in the world. Make sure to add the shrimp just before serving so that they stay nice and tender. Some families boil eggs in their shrimp stew (as it simmers) to make the dish even heartier. 1. Heat the oil in a heavy-bottomed Dutch oven over medium-high heat and, when hot, add the flour. Whisk to combine and continue to cook, stirring constantly, until a medium roux is formed (it should look a bit darker than peanut butter), about 10 minutes. (If the roux begins to brown too quickly, reduce the heat to medium or medium-low and take your time—it is important that the roux not be burned at all or the stew will have a bitter taste.) As soon as the roux is the right color, add the chopped onion and cook until soft, stirring occasionally, 4 to 6 minutes. 3. Toss the shrimp with the remaining ½ teaspoon salt. Stir the shrimp, green onion, and parsley into the stew and continue to cook until the shrimp are just cooked through, 3 to 4 minutes. Taste and adjust the seasoning if necessary. Remove the bay leaves. Serve the stew in shallow bowls over hot white rice. This stock is so easy to make, yet so flavorful—make a batch every time you have shells and heads from fresh shrimp and you’ll never have to worry about where to get shrimp stock again. You’ll find that toasting the shells in oil before adding the water gives added depth to this stock, which can be used in countless ways. 1. Rinse the shrimp shells and heads in a large colander under cold running water and allow to drain. 2. In a large stockpot, heat the oil over medium-high heat. When hot, add the shrimp shells and cook, stirring occasionally, until the shells are pink and toasty-fragrant, 4 to 6 minutes. Note: You can easily double the ingredient amounts to make a larger batch of stock. To save space in the freezer, you can reduce the stock further after straining and discarding the solids. Just add water to the defrosted stock to reconstitute as needed. Here it is, what you’ve all been waiting for — how to get your hands on Emeril’s new book (if you want to guarantee you get it, head on over to pre-order it for yourself). To win your free copy, comment below telling me which of the Emeril recipes GroovyFoody has previewed that you just can’t wait to make! To increase your odds of winning — get a second entry by tweeting the link to this post and posting the link in the comments section below. Wanna stack the deck in your favor? Check out the other 19 Emeril One-Pot Party Bloggers (listed above or to the right) and enter to win on their sites as well. Winner will be chosen by random drawing by my precocious 3 year old. Contest is open to US residents only, and but HURRY the contest will only be open from now through midnight, pacific time, October 1. Full disclosure: For my commitment to this blogger cooking party, I received a copy of this cookbook, as well as a set of Emeril – by zak! Table Art 7-piece Flame-Shaped Serving Bowls, and Emeril Seasoning; a $50 grocery reimbursement and Emeril cookbooks upon completion of the party. The top performing blogger, as selected by T-Fal, will be awarded an Emeril by T-Fal Slow Cooker. Emeril’s Sizzling Skillets: A Quiz, A Recipe — A Giveaway! As we’ve been cooking our way through Emeril’s dishes some of the other bloggers and I have become rather chummy, because well, what’s not to like about a fellow foodie! There are 20 of us in all and I encourage you to make your way around to all of us but a few of us have really stuck by each other throughout this one-pot journey. Winner will be chosen by random drawing by my precocious 3 year old. Contest is open to US residents only, and will be open from now through midnight, pacific time, October 1. Oysters and artichokes — I’m a crazy about them both. So imagine my delight when I opened Emeril’s New cookbook, Sizzling Skillets and Other One-Pot Wonders and found a recipe whose ingredient list contained, not only, those two favorites but mascarpone, shallots, dry white wine, butter and cream — sinful! According to the rules of Emeril’s cookbook launch none of us previewers are allowed to give you the recipes (the cookbook is available for presale now!) But I will give you a few preview pics, a tease of ingredients and a bit of poetry to whet the appetite — for what is sexier than oysters, artichokes, cream, wine and poetry. Pssst. . .Wanna Win a 7 pc set of Emeril by Zak! Flame serving bowls? Know what goes great with soup? Popovers — but not just any popovers, smoked Gruyere popovers. I make mine quick and simple by using a basic choux pastry recipe and stirring in the grated cheese of my choice, once the batter is mixed. Then spoon out 1/4 cup fulls onto an ungreased cookie sheet — 25 minutes later, you have light, cheesy perfection! Heat oven to 400 degrees. Heat water and butter in a saucepan, once the butter has melted add your flour, stirring vigorously over low heat or until mixture forms a ball. Remove from heat. Beat in eggs all at once, beating until smooth. Drop by scant 1/4 cup fulls onto an ungreased cookie sheet for 25 to 30 minutes, unitl golden and cooked through. Cool away from draft. Serve while warm.